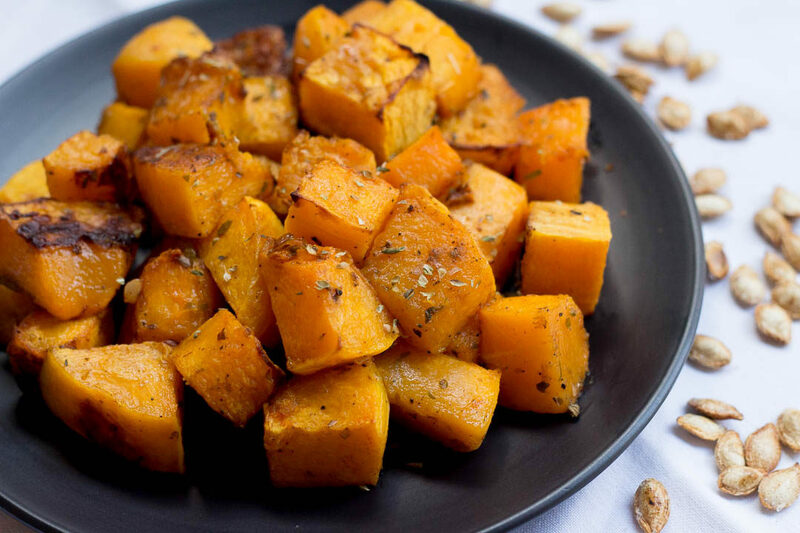 Roasted butternut squash is the simplest way to use this hearty winter vegetable. Just cut, toss in spices and bake till tender. Toast the seeds to make for a quick snack. Living in the land down under (aka Australia) requires a bit of adjustment. For instance, it’s the month of July and I cannot go out without wearing a proper fleece jacket or a wool coat. Yes, that cold! Why? Because the seasons are upside down here and so it’s the middle of winter here. Takes a bit of getting used too! 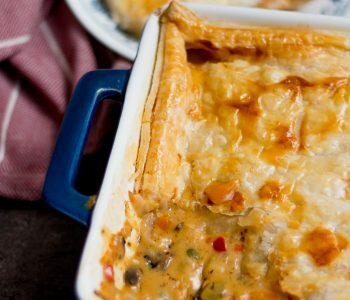 The chilly temperature drop means shifting our meal choices to winter recipes like a rich hot chocolate, a comforting shepherd’s pie and creamy butter chicken. It also means the seasonal produce available in the market is again winter themed, so lots of citrus and root vegetables. One such ingredient in season is the butternut squash. An ingredient that I had heard a lot about, but had not tried yet. I got one half from the supermarket and then proceeded to look up recipes to make with it. The simplest and most popular one was the roasted version, which is what I decided to make for my first experiment. 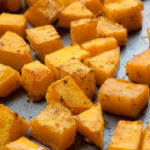 It requires cutting up the butternut squash, tossing in herbs and spices and baking till tender. The earthiness and sweet flavour of the roasted butternut squash was similar to our shakarkandi or sweet potato. 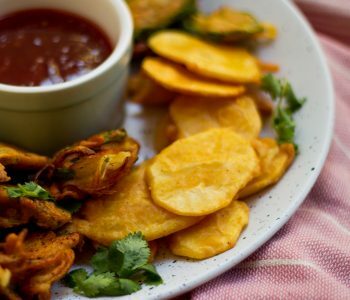 Good to eat on its own, or served as a side to grilled meat (beef steaks or chicken fillets). The seeds can be washed and toasted in the oven to be added in salads or enjoyed as a snack. The skin and flesh of butternut squash can be quite tough so make sure to use a good peeler and knife when peeling and cutting, being extra careful not to cut yourself. 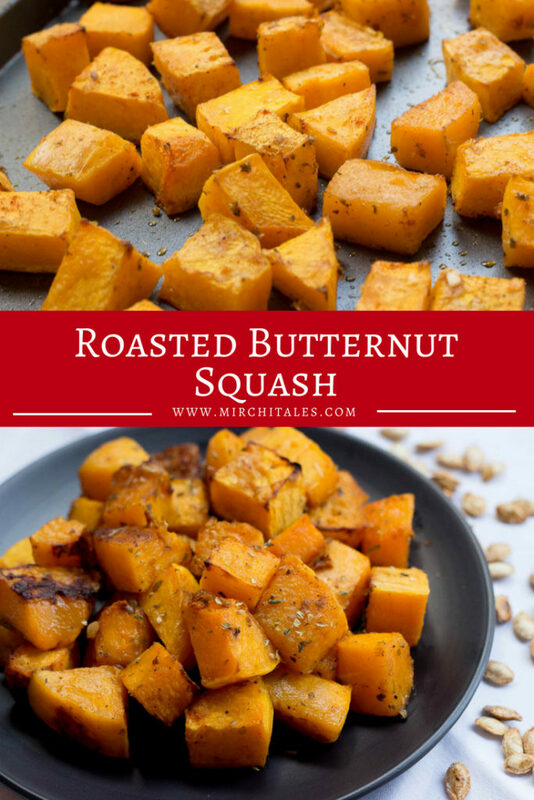 Roasted Butternut Squash Roasted butternut squash is the simplest way to use this hearty winter vegetable. 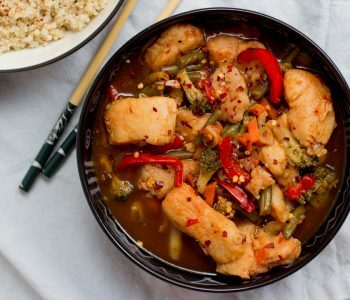 Just cut, toss in spices and bake till tender. Toast the seeds to make for a quick snack. Scoop out the seeds of the butternut squash, and set them aside. Wash, peel and then cut the butternut squash into cubes. Place the cubed butternut squash in a bowl. Add salt, black pepper, oregano, red chili powder, olive oil and chopped garlic. Toss together till the butternut squash is completely coated. Place the cubed butternut squash on a baking tray making sure that they don’t overlap each other. Bake for about 30 – 35 minutes till the squash is fork tender. Turn over the squash half-way round the baking process. Meanwhile, take the seeds of the squash and wash them to remove the membrane. Drain and dry the seeds, and then place them in a bowl. Season with salt, black pepper and olive oil. Toss to coat. 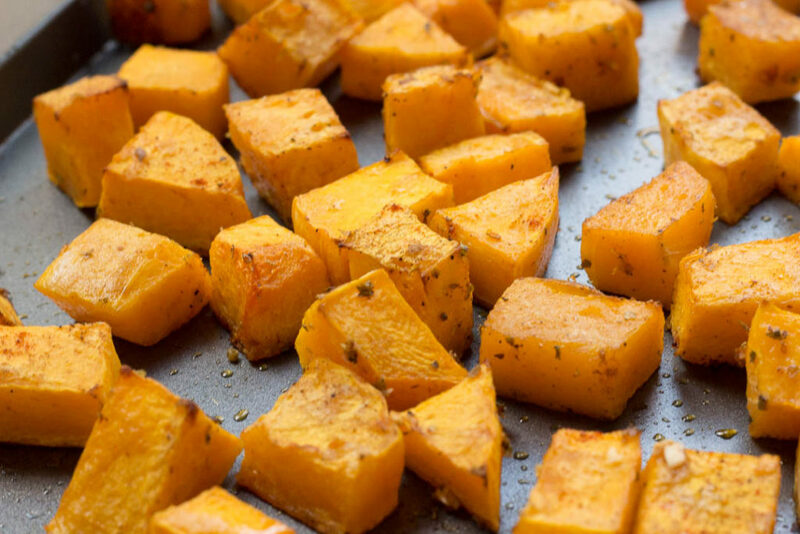 Once the butternut squash is roasted, remove the baking tray and place the seasoned seeds in the baking tray. Bake for about 10 – 15 minutes till toasted and golden brown.